The Sauce is a mixture of Sore No More liniment combined with Povidone Iodine. It can be used alone or mixed as a Sugardine dressing. This herbal dressing combined with sugar may be one the most effective sugardine combinations yet. Sugardine is an old time remedy of mixing iodine and sugar to form a paste that is then applied to open wounds, abscesses, or resected hooves to reduce inflammation, infection, and healing time. If you choose to make a Sugardine dressing, simply add sugar to make a hoof packing for abscesses and thrush. Cover with a bandage or wrap/dressing. 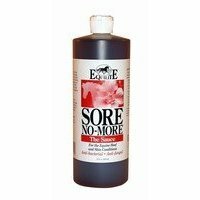 Of course, you can use Sore No More The Sauce straight out of the bottle, as a topical anti-bacterial, anti-fungal paint to be used on scratches, hooves prone to thrush, infection, or traumatized areas.